Ali Tax & Business Services | You're not just another client! If you enrolled in coverage through the Marketplace you will need the information on Form 1095-A to complete Form 8962 to reconcile any advance payments of the premium tax credit or claim the premium tax credit, and to file a complete and accurate tax return. If you need a copy of your Form 1095-A, you should go to HealthCare.gov or your state Marketplace website and log into your Marketplace account, or call your Marketplace call center. Although information from the Form 1095-C - information about an offer of employer provided coverage - can assist you in determining eligibility for the premium tax credit, it is not necessary to have Form 1095-C to file your return. 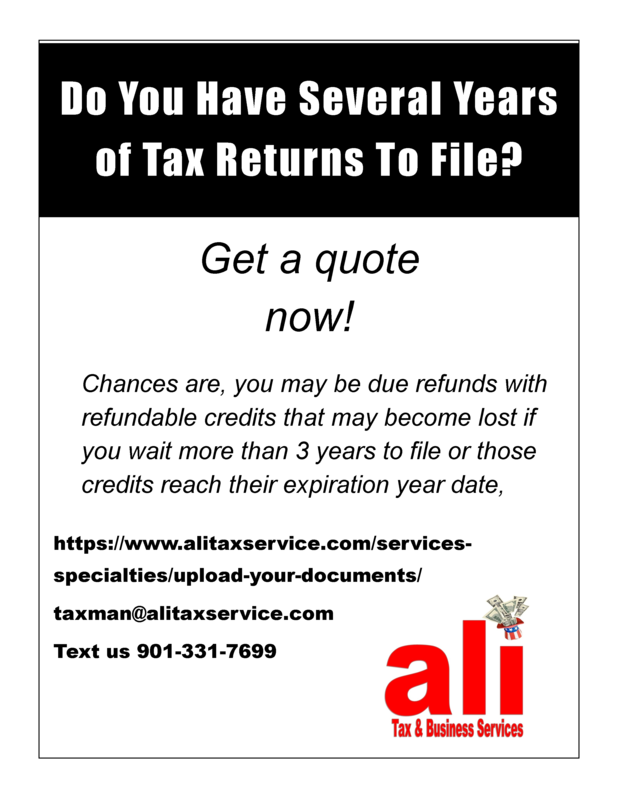 See Publication 974 for additional information on claiming the premium tax credit. You do not have to wait for either Form 1095-B or 1095-C from your coverage provider or employer to file your individual income tax return. You can use other forms of documentation, in lieu of the Form 1095 information returns to prepare your tax return. Other forms of documentation that would provide proof of your insurance coverage include. Fees below are effective October 21, 2017. Most industry surveys confirm that the fees we charge for our professional services are very reasonable and competitive. They are also not negotiable. If the price is your most important consideration, and you find someone else who will work cheaper, go for it, but remember that you "get what you pay for". Tax planning, consultations, or e-mail consultations that require research, document preparation, or longer exchanges, are billed at $180/hour in 30 minute increments of $90 each from the start of the session. NOTE: Information provided to us during Tax Return Preparation is confidential but subject to subpoena, whereas Tax Planning and Business Consultations are “Privileged Communications” not subject to subpoena. • Two (2) Hours of Business Consulting, including 1 year of Registered Agent service. NOTE: Other States may have additional charges. You must incorporate (or register as a 'Foreign' entity to do business) in the State where your business physically resides or has activities that qualify as "doing business." • 1 year of Registered Agent service. NOTE: Creating a Non-Profit entity (whether or not it is Incorporated) does not automatically make it Tax Exempt or able to issue tax deductible receipts for Donations. EXISTING NON-PROFIT entity REQUEST for TAX EXEMPTION carries a Document Preparation Fee of $450 that includes compiling IRS Form 1023/1024 depending on type of Non-Profit) plus Registration as a Charity with the Attorney General, and participating in follow-up interaction with IRS until they issue their Determination Letter. This fee applies to Non-Profit entities that we did not create. NOTE: IRS requires a $400 Filing Fee if the organization’s annual Gross Receipts will be $50,000 or less. IRS requires an $850 Filing Fee if the annual Gross Receipts will be greater than $50,000. Our fee does include the CA Form 3500 fee of $25 and the Registry of Charitable Trust Basic Fee of $25. MERGER or DISSOLUTION fee for a Corporation or LLC is $75.00 (in addition to any State Filing Fees). The $75 includes a certified copy fee that the State charges. If you are in business, you MUST maintain a formal set of Books of Account that will be requested if you ever have an Audit. We can help you with that (see our fees below). Be warned that IRS is now routinely requiring, during business audits, an electronic copy of Taxpayer's self-maintained QuickBooks File if that information was used in tax return preparation. BOOKKEEPING SERVICE fees are prepaid monthly (at the start of each month's service), are based on the time and expertise required, completeness of your data, and timeliness in receipt of your data. Our pricing "rule" is $1.00/transaction, or $75/hour whichever is greater, but not less than $75/month for Financial Statements issued, (note that deposits are posted as a single transaction unless your business requires tracking each deposit, sale, product or item). NOTE: Writing and/or signing checks (with your rubber stamp signature) costs $7.00/check (discounts available for Non-Profits). A NON-REFUNDABLE, MINIMUM FEE RETAINER of $450 IS REQUIRED FOR ALL NEW ACCOUNTS ENGAGED BEFORE NOVEMBER 1st (after that date see "Year-End Bookkeeping" below). "YEAR-END" BOOKKEEPING. December and January are two of our busiest months due to tax agency deadlines--if you cannot possibly bring in your records until then we cannot guarantee your return will not need to be extended, and you will be billed at the same rates above but subject to a non-refundable, Minimum Fee Retainer of $900 ($75 x 12 months). Work will begin on your "Year-End" Bookkeeping after we receive your Retainer. BILLING POLICY. Invoiced Accounts that are not paid in full within 30-days are subject to $10/month Late Penalty Fee. Checks Returned for ANY reason, or amounts charged back Credit Card payments are subject to a $50 NSF, Returned Item, or Credit Card Chargeback Penalty Fee. NOTE: Any payments received after a Penalty Fee is assessed are applied first to such Fees assessed, and the balance of the amount originally owed. PAYROLL SERVICE is provided through affiliates in that field. Call for an estimated fee for your situation. Fees depend on services requested which may include writing checks on your account (for your signature), direct deposit, debit and payment of taxes and quarterly tax filings. Year-end reporting is provided if service is uninterrupted through year-end. TAX RETURN PREPARATION fees are based on forms used in the return AND THE TIME AND EXPERTISE REQUIRED, include Electronic filing and any one State filing. Tax Returns will not be released to the client for removal from our office (even in "draft" printed or PDF format), or e-filed until our fees are paid in full. • $60 Form 1040EZ ~ $40 for a 1040EZ for your Dependent Child/Student under age 24 if we prepare your return. • $35 Form 4684 Casualty Losses, per loss, except for Presidentially Declared Disaster Losses which are free of charge. • $15 Interest & Dividend Income Schedule-B. If you have a Foreign account or Trust, a separate form will be required and the fee is $100. • $75 Rental Income Schedule-E (Residential and Commercial Rentals) (Minimum Fee per each property and includes Depreciation Form 4562, and Passive Loss Limitation Form 8582 and related Worksheets). Income and Depreciation on Rentals are Audit Targets. Bring your prop statements and HUD statements from purchase and Improvement Loans. • $75 ($195 total) Earned Income Tax Credit (EITC) (parents with children) due to new "due diligence" requirements placed by IRS on Tax Preparers we shall require the following, additional documentation to be provided by the Taxpayer: school, child care provider, landlord, medical or other records that designate the child’s place of residency as that of the Taxpayer; if child is disabled a Doctor, health care provider, or Social Services agency statement; if parent is self-employed a copy of your business license, and records of gross receipts and expenses provided by Taxpayer. NOTE: We are now required to retain these documents for 3 years. • $100 CA Registered Domestic Partners (RDP’s), whether mixed gender or same gender unions must file separate, de-coupled federal and state returns reflecting full information on both parties. This fee is in addition to the per form fees for the returns based on the above. RDP's must be registered with the CA Secretary of State, and may file joint returns at the State level while at the Federal level they file individual returns but splitting income and expense as if filing married-Separate. • $100 First Time Homebuyer Tax Credits (are claimed on "paper-filed" tax returns and are different for Federal and California, require extensive documentation to be provided by the taxpayer). Fee is $50 for Federal only credit. This fee is in addition to the fees for the returns based on the above. • $50 each for 2nd or additional State returns. Not all Forms/Schedules that may be needed for your return are listed above. Prior year Non-Filers must pay a $195 per year, Non-refundable, Minimum Fee Retainer, execute an IRS Power of Attorney Form 2848, provide full relevant documentation (before our work commences), and must also agree to have no further direct contact with IRS. 2. CORPORATION ("C" or "S"), PARTNERSHIP, LLC RETURNS preparation fees are based on the time and expertise required, and the complexity and degree of organization of your data. NOTE: If the entity sells products, carries inventory, or exceeds the above amounts, the return will be required to file a Balance Sheet -- that will add $175 to the Minimum Fee, making it $750. If additional Schedules or Forms are required there will be an additional fee for each such Schedule of Form. 3. ESTATE RETURNS ("Death Taxes") are subject to a $1,200 Non Refundable Minimum Fee Retainer, require the execution of a Form 2848 IRS Power of Attorney by the Executor, and are based on the time and expertise required, the degree of organization of your data and supporting documents, and whether there are any challenges by the IRS to Asset Valuations reported. 4. NON-PROFIT RETURNS (for Taxable Foundations or Sec. 501(c) Tax-Exempt Organizations), Forms 990 or 990EZ, are based on the time and expertise required and the degree of organization of your data. Minimum Fee is $575 providing there is no "Unrelated Business Income" (that is taxable and requires an additional Form 990-T filing with a Minimum Fee of $125). Fees include electronic filing (if available) and one State. 5. TRUST RETURNS (Fiduciary Returns) are based on the time and expertise required and the degree of organization of your data. Minimum Fee is $475 (for a Simple or Grantor Living Trust), or $600 (for a Complex or Decedent's Estate Trust), plus $15 for each Beneficiary Schedule-K-1. Fee includes electronic filing (if available) and one State. If additional Schedules or Forms are required there will be an additional fee for each. TAX AUDIT REPRESENTATION fees are hourly based, subject to a $2,160 prepaid, non-refundable, Minimum Fee Retainer PER INCOME TAX YEAR UNDER AUDIT, and do not include any subsequent Appeals or Tax Court Hearings or related filings. Tax Audits are increasingly being conducted by correspondence (those more often than not end up in Appeals), sometimes at the IRS' office locally, but more often are held in our office if the return involves a business. If the Audit scope or complexity increases and more time is needed than is covered by the above Retainer, you will be asked to provide additional funds. TAX AUDIT APPEALS (or Collections) fees are hourly based, subject to a non-refundable, $600 prepaid, Minimum Fee Retainer per Income Tax Year if we handled the underlying Audit. If we are taking over from someone else the Minimum Retainer will be $1800. 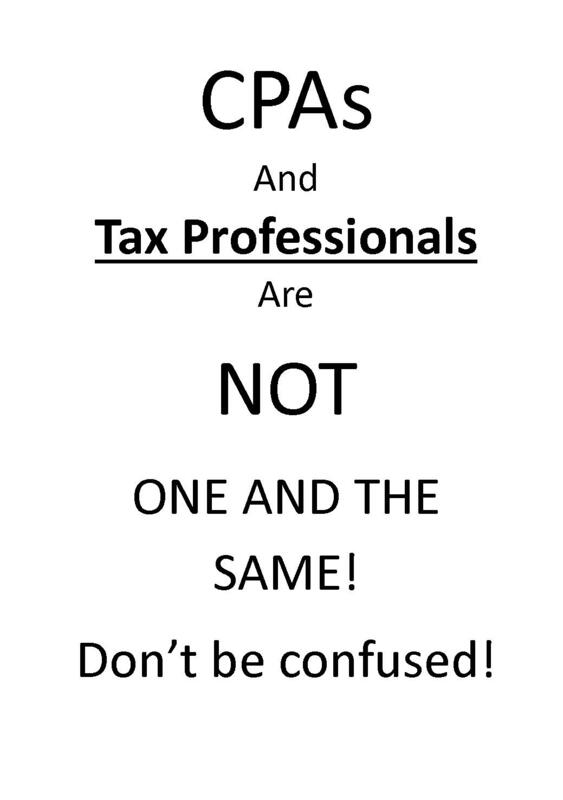 TAX REPRESENTATION (Outside of Income Tax Audit), such as Reviewing and Responding to an IRS CP-2000 "Notice of Proposed Assessment" (based on omissions on your tax return), or other tax agency matters (EDD, FTB, BOE, or other) that require written replies or telephone resolution are subject to a $125 non-refundable Minimum Fee Retainer -- avoid this fee by reporting ALL your income in the original return! I don't know of a government that does not tax its citizens. 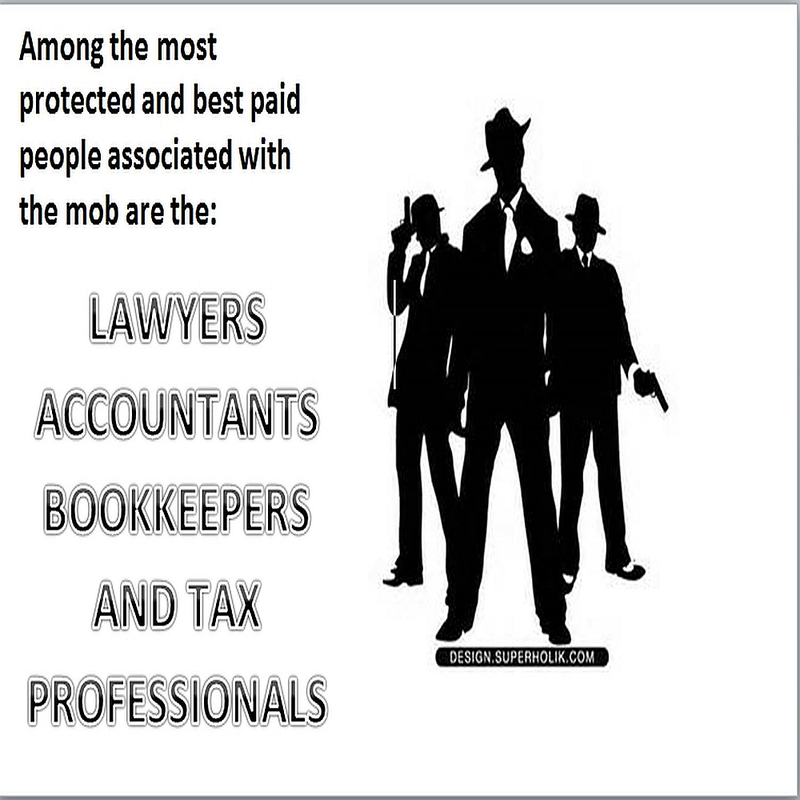 Many people like to debate about who should be paying and how much, alas that is not the concern of the tax preparer. Do you enjoy wagering at casinos and participating in other games of chance? The IRS requires you to pay tax on your fair share of winnings as reported by the "house." Specifically, the IRS simplified and updated existing rules for providing required information. Here's the whole story: For starters, you must pay tax on gambling winnings, but you can offset some of the tax by substantiating losses up to the amount of the winnings. To keep track of winning amounts, the IRS generally requires reporting for $600 or more in a year, but prior regulations established higher amounts of $1,200 for bingo games and slot machines and $1,500 from keno. These payments are reported on Form W-2G, Certain Gambling Winnings. Among other requirements, Form W-2G must include the name, address and taxpayer identification number of the recipient and a general description of two forms of identification used to verify this information. Reportable winnings for bingo means winnings of $1,200 or more from one bingo game without reduction for the amount wagered. All winnings received from all wagers made during one bingo game are combined. Reportable winnings for keno means winnings of $1,500 or more from one keno game reduced by the amount wagered on the same keno game. All winnings received from all wagers made during one keno game are combined. Reportable winnings for slot machines means winnings of $1,200 or more from one slot machine play without reduction for the amount wagered. Tip: The new final regs are generally effective for gambling winnings from bingo, keno and slot machines reported after 2016. Copyright 2017 Business Management Daily, a division of Capitol Information Group, Inc. All rights reserved. "There's no need to fear..." ATABS is here!!! (Bloomberg) - More than halfway through the 2017 filing season, the U.S. Internal Revenue Service reported receiving 5.7 million fewer individual returns than at a comparable point last year. That’s an 8.5 percent drop. FYI AND FOR THOSE WHO HAVE IT "TWISTED"
What does THIS STATEMENT Presuppose? When long-term disability premiums (LTD) are paid with pre-tax dollars, the monthly disability benefit becomes taxable income. The BENEFIT should FAR EXCEED the amount paid in PREMIUMS. Taxing the benefit instead of the amount paid appears greedy. The premiums paid in advance of the retirement period is money being used by the Insurer immediately and possibly long term. Don't they (The Insurer) have to pay taxes on that money as INCOME? How many times is the Government trying to get paid on that money? Ok, so the money having been made by you and spent on insurance, but "not counted" for tax purposes is money the Government loses. It is also a lost deduction because you are not supposed to claim it as an expense although it was. I wonder which is greater, the loss of the tax to them, or the deduction to you annually?